The higher level phylogeny and systematics of scorpions is complicated and there are several models for this. Prashant P. Sharmaa and several co-workers have now published an article on the phylogenetic placement of the family Bothriuridae. 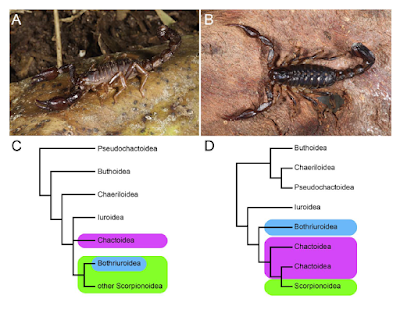 The article also presents new data on the high- level scorpion systematics and the first phylogenomic dating of the arachnid order Scorpiones. The scorpion family Bothriuridae occupies a subset of landmasses formerly constituting East and West temperate Gondwana, but its relationship to other scorpion families is in question. Whereas morphological data have strongly supported a sister group relationship of Bothriuridae and the superfamily Scorpionoidea, a recent phylogenomic analysis recovered a basal placement of bothriurids within Iurida, albeit sampling only a single exemplar. Here we reexamined the phylogenetic placement of the family Bothriuridae, sampling six bothriurid exemplars representing both East and West Gondwana, using transcriptomic data. Our results demonstrate that the sister group relationship of Bothriuridae to the clade (“Chactoidea”+Scorpionoidea) is supported by the inclusion of additional bothriurid taxa, and that this placement is insensitive to matrix completeness or partitioning by evolutionary rate. We also estimated divergence times within the order Scorpiones using multiple fossil calibrations, to infer whether the family Bothriuridae is sufficiently old to be characterized as a true Gondwanan lineage. We show that scorpions underwent ancient diversification between the Devonian and early Carboniferous. The age interval of the bothriurids sampled (a derived group that excludes exemplars from South Africa) spans the timing of breakup of temperate Gondwana.